The snow has rapidly crept its way down the Annapurna range this week, and there is a definite chill in the air to indicate winter is on it’s way. I’m not sure where the last one and a half months went, it is a little bit sad to be leaving, but onwards it is for the next experience. Snow on Annapurna Mountains. A view from GPHRC. I spent my last days visiting Tibetan villages around the Pokhara region. My purpose was to find out more about traditional Tibetan medicine. My excursion turned in to one of the most interesting experiences I have had. I learnt a lot about the history of the Tibetan people now living in Nepal and their current struggles. Those who are now living here are families who successfully fled to Nepal during the invasion and brutal take over by China in the late 1950′s to early 1960′s, in effort to secure Tibet as part of its territory for its abundant natural resources. 1.2 million Tibetans were killed in the process. The Tibetan people feel deep sorrow for the fate of their country. When they arrived in Nepal it was not easy going either. The camps which were set up for them were poorly equipped to handle the monsoon rains and had no infrastructure to handle sewerage or waste. With the warmer weather and close living quarters many suffered from illness including out breaks of dysentery, TB and small pox and a lot died. Over the years the Tibetan people living in Nepal have established permanent and well set up little communities. They like to live in these communities together as they feel it helps to keep their customs and culture alive. They largely govern themselves and each village has schools, shops, medical center, community hall and in one community, an old peoples home for those without family to care for them. Few have refugee status and most Tibetan’s born here have no formal status as citizens in either country, Nepal or Tibet. No citizen status makes life difficult. Legally they can not be employed, start a business, own a car or land and cannot migrate to other countries in search of other opportunities (unless they pay large ‘under the table’ sums for fake identification or refugee status). Consequently, alcoholism and depression is a huge problem for their young people who struggle to find work and have little to do to pass their day. The Tibetan people and some dedicated outsiders are working hard to establish jobs in these communities to give their young people a sense of purpose and income through working at noodle, carpet and juice making factories for example. It is a really fascinating story. 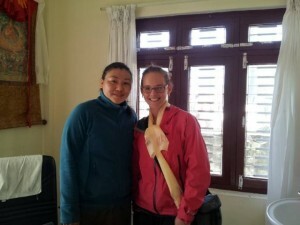 Natalie Irving with the Tibetan Medicine Doctor. Tibetan medicine is a very old form of medicine. I visited and talked to a doctor in one of the settlements who is the only traditional medicine doctor in the Pokhara area. I even got my own check up which was to say the least…interesting. 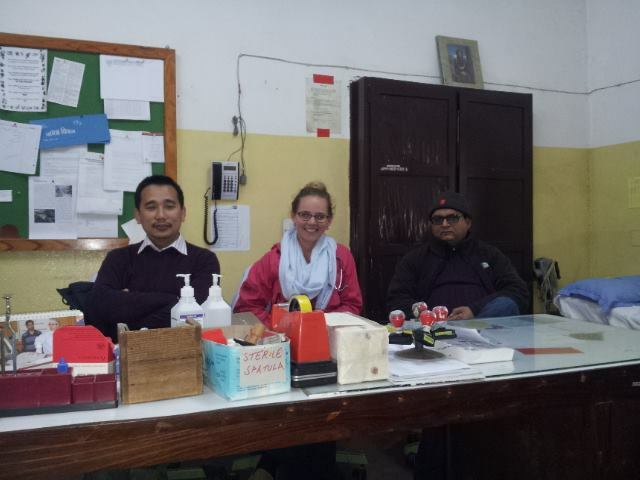 There are 5 traditional Tibetan medicine clinics in Nepal. This particular doctor trained for 7 years at a school in India in Dalai lama’s place of exile, Dharamshala. It is all quite complicated but she explained it to me like this; Tibetan medicine believes that there are three energies required for health and when one is out of line then there is a state of ill health. They mainly use the pulse and examine the urine to determine which meridian is not healthy. They do not perform or use any investigations and the medicine is largely herbal based. According to my pulse, I have inadequate liver function, so I need to drink more water, avoid sugar, potatoes, cold foods at night time and dedicate more time in my day to exercise… some very good suggestions there! Lifestyle management and herbal medicine is first line treatment in Tibetan medicine, second line is other treatment forms such as massage or acupuncture and finally the next tier of treatment is hot scolding using a special plant (eek!!). Interestingly, they do recognize western medicine and will refer the patient to other hospitals if they feel this would be in the patients best interest, but it is ultimately the patients choice and some prefer to use traditional methods only. 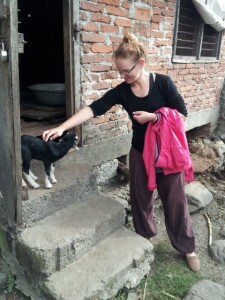 There is also a western medicine clinic in another of the villages where a Nepalese doctor is employed to provide care. Here the clinic is paid for by the community, all care required by Tibetans in the village is free. The doctors clinic. On the left is Dr Jas and right Dr Biswa (Chief Dr of GPHRC). Dr Kamal was unfortunately away on my last day. So as I draw this chapter in the country of Never Ending Peace And Love and at GPHRC to a close, I feel I have learnt so much about leprosy, the health system, people, culture and history. What I have seen and done has been absolutely fantastic and I have had nothing short of the best time. If I wanted to experience medicine and the difficulties faced in an under-resourced country and hospital, I certainly have done that here! Instruments we would dispose of after one use in New Zealand are used over and over and over here, there is no room for wastage. I always felt guilty disposing of seemingly perfect instruments, but now even more so. I feel like I should collect, sterilize and send them to Green Pastures, they really could do with a pair of scissors which cut through a crepe bandage in one go rather than four or five. Things operate differently when there are no resources on hand. For example, during a clinic, and after listening briefly to a leprosy patients chest himself, one of the doctors kindly offered and suggested that I perform a full respiratory examination on the patient in his wheelchair. I did my best, between having my instructions interpreted to the patient and dodging around the layers of clothing and the wheelchair. I had been looking and listening to the patient for the last couple of minutes and had started to develop a clinical picture in my mind already, it wasn’t quite fitting completely with the diagnosis of COPD in the notes, although there may have be a degree of that too. The patient’s complaint was shortness of breath but the doctor was keen to discharge him because “he is consuming too much oxygen”- the hospitals bottled oxygen supply that is. The patient was cachexic looking and had a very hoarse voice – alarm bells had already gone off in my mind. My examination revealed some marked clinical indicators as well, still not totally fitting with a diagnosis of COPD. I tossed up suggesting an x-ray may be helpful to rule out serious lung pathology and this would certainly have been an urgent request had I been presented with this patient in New Zealand, but what could be done? Even if the patient had the money to pay for an x-ray, he certainly wouldn’t have had any money to access the on-going medical care and treatment he’d likely need afterward. As a result, the patients diagnosis remained as COPD in his notes. The doctor then disappeared and returned with a box of symbicort. He had to ask me how to use the breath activated device because they are so uncommon here. They are just too expensive for most Nepalese to afford. I noticed the prescription on the box was for a western-females name, all written in English so I guess it had been left to Green Pastures perhaps by a visiting volunteer. I also noticed the expiry date was 6 months earlier….minor details. The patient was given 2-puffs then wheeled out the door by the doctor, the inhaler was popped back in to the box for the next person. Saying goodbye to the Hospital farm baby kids. These situations are difficult. There have been many times when I have spotted suspicious looking growths or clinical signs that would make my stomach flip if I was faced with them at home, but the patient is here for (funded) leprosy management and many other coexisting health problems or issues are often left unattended. Is there any point to starting a dialogue and suggesting investigations/imaging they might need so they are fully informed? Or would that be counter productive, given most patients would have no way of funding such investigations, meaning they are left to worry, but unable to do anything, or take large loans to finance their medical care when nothing may be able to be done anyway? As a result there are many ethical and moral dilemmas to consider! When a severely short of breath patient is said to be consuming “too much of the oxygen”, you realise no matter how hard you try, many of the ethical, moral and professional values developed over the last few years are so hard to apply with any vigor under the current system here. The situations and circumstances are just so different to home – that does not make it any easier to see the patient wheeled out knowing the treatment that was received was very brief compared to what you or I might have come to expect from our health system at home. Unfortunately health care here really is a luxury for those with money to buy it. In many instances, what you do when you don’t have resources; is sadly nothing. So with all the good memories, learning and life lessons, I am off. I will see you next time from Siaya, Kenya. 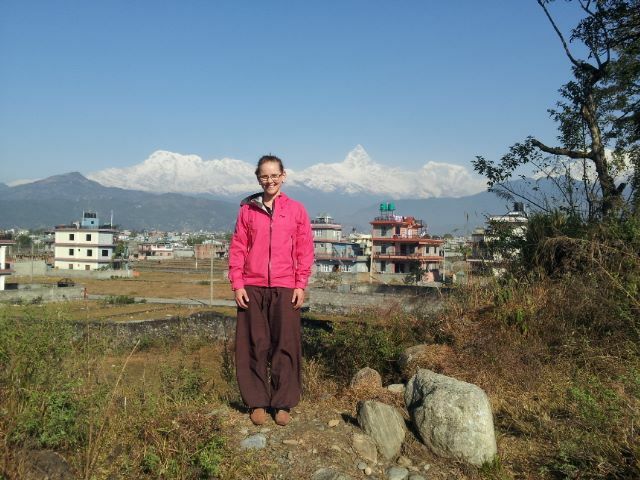 I was in Katmandu at the international congress on Sowa Rigpa in December. I have been a practitioner of Tibetan Medicine for several years and have given a few presentations here since I moved here in February. Dr. Barry Clark is also very well qualified should you be able to speak with him. I live in Hawkes Bay, and would love to connect with you if you are interested in furthering any study of Tibetan Medicine(Sowa Rigpa). You could also try calling me 021 1164012. 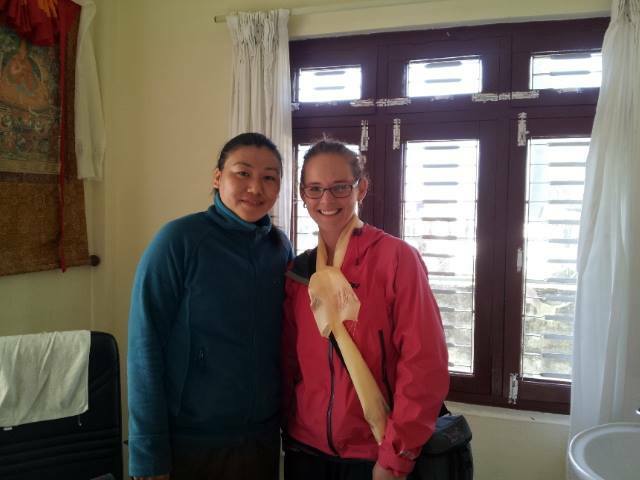 We are looking for a permanent resident to host courses in Tibetan Medicine….